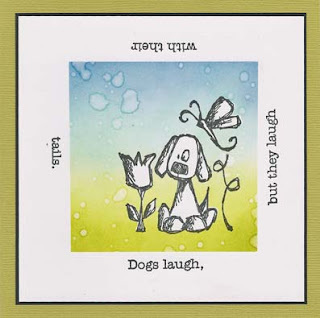 Isn't he cute this little doggie with his tulip from the new September 2011 release? I made this real quick and easy card for Crazy amigo's, a Dutch challenge site. I used distressinks and water for the background. 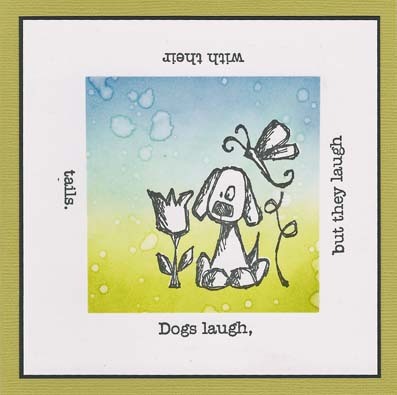 These are the stamps I used Tulip and Dogs laugh. I used the quotestamp one line at the time by masking the rest of the words and using a stamp ruler to get the words in the right place. great background, love the distress inks and water! Under the Parapluie-Clean and Simple!